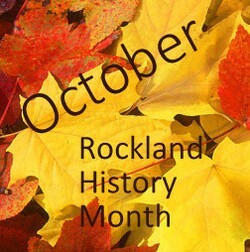 October Is Rockland History Month, and to celebrate, The Historical Society of Rockland County will offer several events. First, they will celebrate the region's best traditions at the Fall Family Festival on the grounds of the Historical Society of Rockland County, Sunday, October 6th from 12noon - 4:00 p.m. Festival attendees will observe demonstrations of quilting, lace making, open-hearth cooking and others. Children can play old time games, write with a quill pen, create clothespin dolls, try stencil art and more! Music will be provided by Ramapo Fault, Rockland’s old-time string band. It’s also a great opportunity to step inside the historic 1832 Jacob Blauvelt farmhouse and learn about life in 19th century Rockland County. The house will be open for guided tours all afternoon. Don’t miss the oddball antics as Dikki Ellis offers a classic old time circus performance with a new age twist. Nickel-O Farms will bring a pony for children to ride from 2pm – 4pm. There will be something for everyone at this outdoor event. Fall Festival Details: October 6, 2013. 12pm – 4pm. On the Grounds of the Jacob Blauvelt House located at 20 Zukor Road, New City, NY. Reservations are not required. Entry fees are $7.00 for adults and $3.00 for HSRC members, seniors and children 3 – 12; children under age 3 are free. Parking is free. The festival takes place at The Historical Society of Rockland County, 20 Zukor Road, New City, NY. As this is an outdoor festival, in the event of rain, it will be cancelled. Next, the Historical Society of Rockland County will continue its long tradition of presenting Historical House Tours. These tours, going back over 40 years are fund-raising events for the Society and at the same time they promote awareness of local history and our beautiful built environment. This year the tour, sponsored by Beckerle’s Remodeling Showrooms, will take place in West Nyack, on Saturday, October 19th from 10am – 4pm. Local Historic and Civic Membership Group Heritage of West Nyack has been working with the HSRC to plan a tour that will showcase West Nyack’s history and charm. This year’s self-guided tour offers a look at historically significant buildings of West Nyack together with eclectic and charming residences. This event will kick off A Weekend in West Nyack presented by Heritage of West Nyack (www.heritageofwestnyack.org). Historical House Tour Details: October 19, 2013. 10am – 4pm. Advance ticket reservations: $ 35 Visit www.RocklandHistory.org. Day of event tickets: $40 at The Traphagan Farm House located at 131 Germonds Road, West Nyack, NY 10994. In addition, the HSRC is pleased present a Walk Through History through the village of Suffern and lunch with County Historian Craig Long on October 26th. This is a unique opportunity to spend the morning with fellow history enthusiasts and our County Historian.